Paignton's Open for Single Handers (POSH) had twenty four mixed class boats competing in the PY fleet with seven RS Aeros made up of five RS Aero 9s and two RS Aero 7s. A big swell from the Easterly breeze prevented a timely launch on Saturday until after the wind had died, so no sailing, leaving an excess of energy and time to sample Paignton and Torquay's nightlife - a dangerous combination! Four good races were achieved on Sunday providing great racing in Torbay with constancy challenging in the mixed fleet. 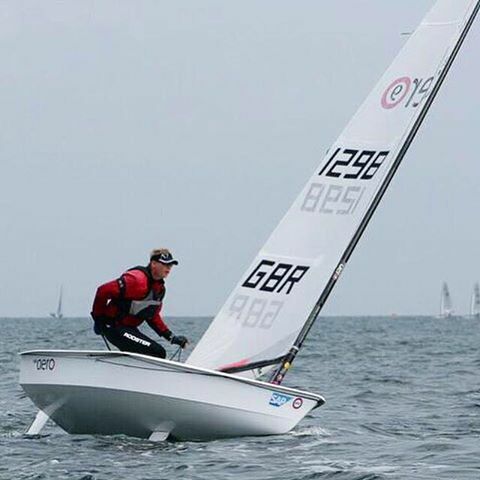 Congratulations to Richard Watsham, the 2016 RS Aero 9 European Champion, of Starcross SC / Royal Navy SA who lead the RS Aeros to win final race and with it the PY fleet in his RS Aero 9. John Warburton nailed the final race in his RS Aero 7 to take 2nd in that race to Richard which propelled him up the score sheet to 6th overall. Thanks to Paignton SC for being great hosts and we look forward to returning next year. Photo: Richard Watsham on his way to winning the 2016 RS Aero 9 European Championships in Germany.